Way before I started this blog, I have already heard lot's of very good comment on Betty's, whom boasts to serve real and authentic Midwest American food. What's even more surprising is the cheap price tag; which is something you usually can't associate with when dining better par western food here in Malaysia. I'm a very huge burger fan myself, and the sight of a good, real, juicy patty burger is like Beethoven to my ears, da Vinci to my eyes, and ..you get what I mean. A burger is really a simple sandwich, but the simplicity and preparation is what really makes it so enjoyable yet tasty. I've read alot and from what I've ressearched, Betty's burger are really special on their own as they are also Non-Halal, and they do have pork and beef burgers, or a combination of both in a patty. Sounds really interesting! 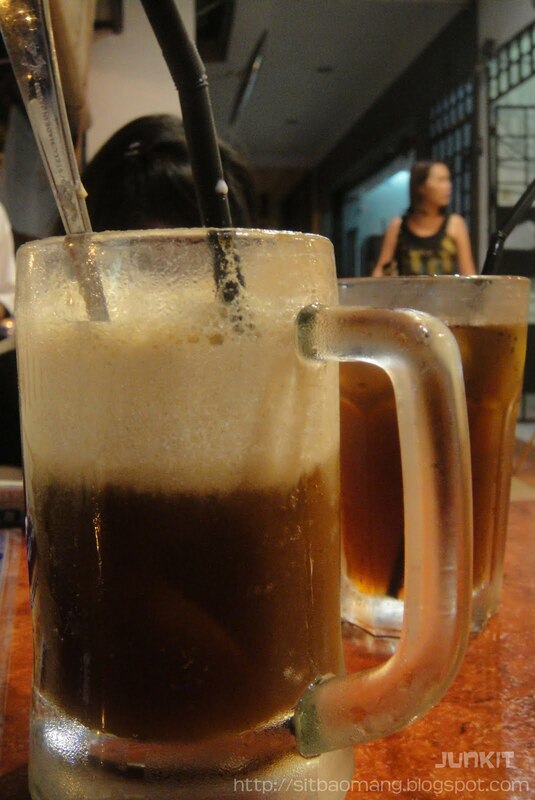 I had the Root Beer Float (RM6.50), which I totally failed to decode what origin and brand of root beer is this. Topped with a vanilla ice cream, the root beer is so different from what I had drank in cans or A & W outlets. The root beer is smoother, not so gassy but tastier. I just have to decode this the next time by asking them! Anyway, a nice cool 'sinful' root beer float is perfect to go with your 'sinful' burger meal ! I call it a cheat meal, haha. The girlfriend is not really a burger fan, and opted for something not so messy. 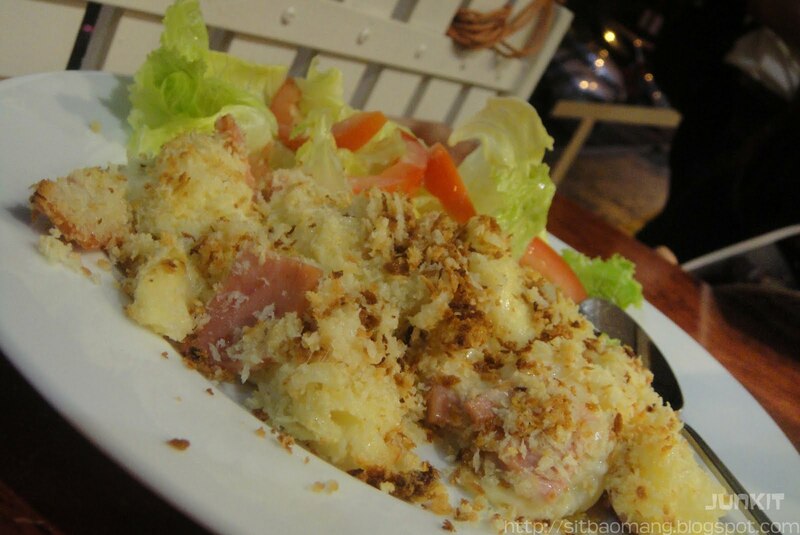 Home Style Macaroni and Cheese (RM 15) is different from what I had expected with breadcrumbs sprinkled all on top. I for one, think it's over baked resulting in the cheese being lumpy and sticks into large pieces of macaroni + cheese. The breadcrumbs do add some texture into it. I'm not sure if it's their style back there, but I think I prefer the old school melted cheese and macaroni combination more. The star of the night, Jucy Lucy (RM13.50). What did I say about cheap? 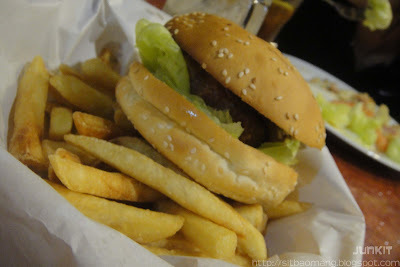 Burgers like these usually cost twice the price in other restaurants! What makes Jucy Lucy so special is that the patty combines both pork, and beef and grilled medium rare. On top of that, cheese are also stuffed inside, which results in melted cheese oozing out with every bite. Words couldn't just explain the joy of having one good burger that the chef knows what's he/she is preparing. The burgers here are served in a basket and comes with thick cut fries. Closer shot of the burger. Average-huge size patty but juicy (somehow, this picture just seems wrong to me). 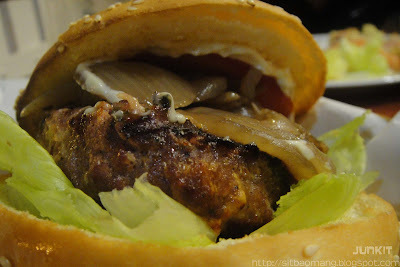 Besides Jucy Lucy, Betty's also serve other interesting burgers like the Pulled Pork Burger (fork pulled pork patty) , Sloppy Joe (ground pork), and the traditional Cheeseburger (grilled beef and pork combination); all for a very low and reasonable price! We also placed an order on a dish that caught our attention, the "Dog Food". Interesting name, and I could see every table has at least one side order of "Dog Food". It's actually oven cooked fries drenched in gravy and topped with cheeses. Sounds as sinful as ever. Unfortunately, that dish was forgotten by the waiter but it's ok as we were already over stuffed by our mains! The bill came up to RM43.25 for the both of us. Pretty affordable for such great food. Betty's environment is pretty cozy, with average size place. Being a no-frill American dining place, I would definitively come back again for other burgers, not forgetting the price vs quality is totally unbelievable! Betty's is closed on Monday, and opens from Tues- Sun in 2 sessions, which are 11.30am - 3pm; and 5.30pm - 1opm. Last calls are at 9.30pm.